Explore the numerous day-trip ideas around Brisbane: Warner Bros. Movie World (in Oxenford), Pelican Feeding (in Labrador) and Sea World Theme Park (in Main Beach). There's still lots to do: stroll around South Bank Parklands, look for all kinds of wild species at Lone Pine Koala Sanctuary, take in nature's colorful creations at Roma Street Parkland, and examine the collection at Queensland Museum & Sciencentre. 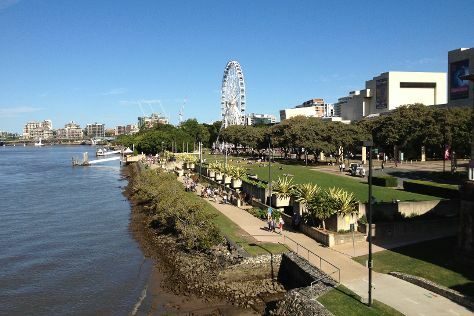 To find traveler tips, more things to do, maps, and tourist information, use the Brisbane trip site . London, UK to Brisbane is an approximately 25-hour flight. You can also do a combination of flight and bus; or do a combination of flight, bus, and train. Traveling from London to Brisbane, you'll lose 10 hours due to the time zone difference. Traveling from London in April, things will get warmer in Brisbane: highs are around 30°C and lows about 19°C. Wrap up your sightseeing on the 25th (Thu) early enough to travel to Cairns. Explore Cairns' surroundings by going to Port Douglas (Safaris, Four Mile Beach, & more), Thornton Beach (in Thornton Beach) and Mareeba Tropical Savannah and Wetland Reserve (in Mareeba). Spend the 26th (Fri) among aquatic life with a scuba or snorkeling tour. There's much more to do: look for all kinds of wild species at Hartley's Crocodile Adventures, kick back and relax at Palm Cove Beach, take in nature's colorful creations at Botanical Gardens, and enjoy some diversion at Esplanade Lagoon Pool. For other places to visit, ratings, traveler tips, and tourist information, refer to the Cairns online travel planner . Traveling by flight from Brisbane to Cairns takes 5.5 hours. Alternatively, you can do a combination of bus and flight; or drive. Traveling from Brisbane in April, things will get somewhat warmer in Cairns: highs are around 34°C and lows about 26°C. Finish your sightseeing early on the 7th (Tue) so you can travel back home.